This 3-bedroom, 1-bathroom duplex apartment has rooms to rent individually in the neighbourhood of Ixelles. All rooms are fully furnished and feature a double bed. Tenants will share use of a kitchen equipped with all that is needed to cook, including an oven, cutlery, dinnerware, pots and pans. There is also a glass dining table where all occupants can get together for a shared meal, and the apartment is equipped with heating, television and a washing machine. 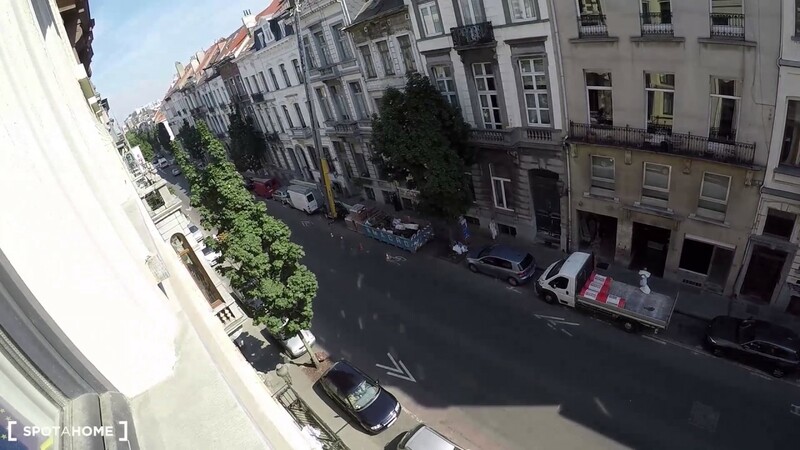 This apartment is situated in Ixelles, a very upmarket area of Brussels. The apartment is surrounded by pretty, elegant architecture, and you will be living near shops, bars, cafés and restaurants. Another attractive feature of this apartment is its convenient location on Rue du Trône, close to Bruxelles-Luxembourg train station and the European Parliament. The interior of the property is bright, clean and modern. Each bedroom has its own sink. You will be living in a perfect location, within walking distance of the European Parliament and the Bruxelles-Luxembourg train station. This apartment is situated on the 3rd floor of a building which does not have an elevator. Buses 60, 38, 95, N08 stop two minutes from the apartment. Train station Bruxelles-Luxembourg and tram station Germoir are 10 minutes away.